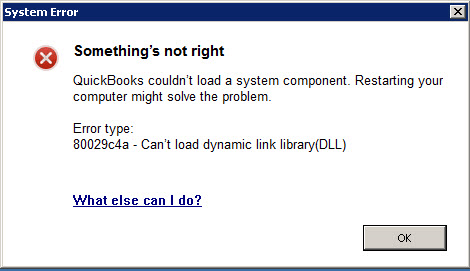 QuickBooks Error Code 80029c4a Error loading type library/DLL can’t load a dynamic link library (DLL). Error 80029c4a is a complex error and is being reported by many QuickBooks Desktop users. Obviously, it’s quite annoying when we have to rush the routine jobs that are done and maintained in QuickBooks and the information can’t be accessed or punched in either. 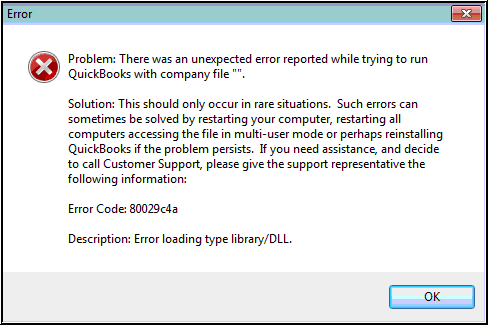 QuickBooks Error 80029c4a can usually arise when QuickBooks component does not start properly or the Dynamic Link Library (DLL) files are missing or corrupted due to the system irregularities. If your antivirus or security, the software has falsely marked any QuickBooks executable file or other components as unsafe. Note: Before you make any changes into your antivirus or security software, please consult the User’s guide or consult a qualified person having core knowledge QuickBooks Desktop Software’s technical aspects. Steps suggested below can help you fix QuickBooks Error Code 80029c4a and put you back on track in no time. Steps are very simple and ought to be followed in the order prescribed. 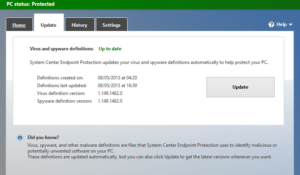 Update your antivirus or security software to the latest release and add the program/component exceptions as per its user manual and then try to open QuickBooks again. Right-click the QuickBooks Desktop icon and choose properties. Wait till the black window disappears with scrolling file names on your computer screen. Restart your computer and QuickBooks should run fine. QuickBooks reboot process brings the software to its optimal default settings, (The software has to updated to the latest release again before you open the company file). QuickBooks Clean Install Tool has a three-fold solution to rectify the problem. Make sure, there is No Company Open on screen. Go to the Help menu, select Update QuickBooks. Choose the Mark all button and then click Save. Wait till the time “Update complete” message appears. Close QuickBooks. You may get a prompt to Install update when you open QuickBooks again. Click Yes and wait till the update process completes and restart the computer. Note: Before uninstalling QuickBooks Desktop, make sure to have the installation file located or downloaded and have your license information handy. We hope that you managed to solve QuickBooks Error Code 80029c4a on your own with the help of this blog, as we have tried our best to give detailed input, to simplify it for advanced and layman users alike. While QuickBooks Error 80029c4a might be one of the most frustrating to deal with, there a number of other ones that arise that can cause an equal level of annoyance, if not more. We have vast experience in dealing with QB error 80029c4a, adding up to over 10 years. Each of our ProAdvisors will keep their cool and stay polite throughout their interaction with you, no matter what. Take away valuable advice and tech-support solutions at minimal expenses, with no wait time whatsoever. Our database is extensive and we will make sure to find the root of each and every error you come across – whether commonly occurring or rare, we solve them all! If you are seeking professional help for error 80029c4a, Contact us at QuickBooks error support telephone number 1-877-263-2742 (toll-free) and speak to a team of Certified QuickBooks ProAdvisors. We feel glad helping you, and you are always welcome over here on this platform. Further, if you ever feel the need of taking advice from your fellow business owners that happened to be our existing subscribers, you can visit our thriving QuickBooks Community. Still, if you do not find an answer for your specific question within the community, in that case, you can also post your question in the community to get the requisite answer from the contributing members.